Historically, attendees at all-day singings would bring their dinners (what lunch used to be called) and at noon would spread them on cloths outside the singing site (generally a church or a county courthouse) on the grassy grounds. Hence "dinner-on-the-ground". Many churches built permanent tables outside under the trees, often made of concrete, and there were and still are made use of by singers on singing days. 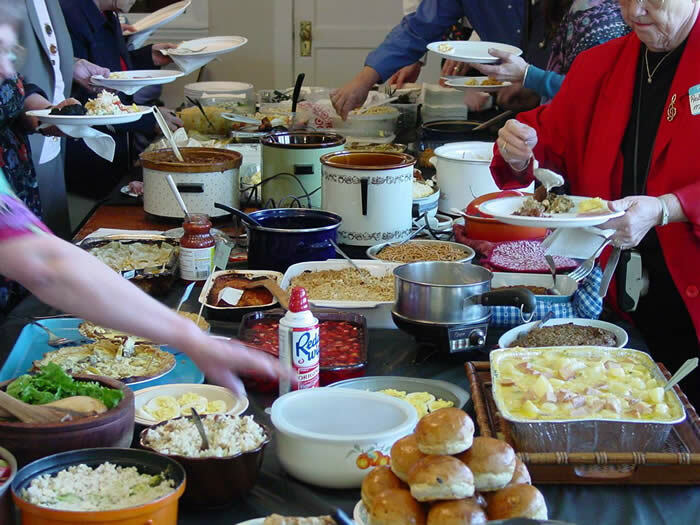 Today, locals bring enough food to feed themselves and all visitors, and at noon the singing is stopped for an hour of glorious potluck. It's our hope that whichever of the all-day singings in Washington or Oregon you attend, when rising from the dinner table to return to the afternoon singing, you will find your body well fortified and your voice fully replenished!